One of the things I love about the Internet: even when the MonSter is out to make me bedridden, physically miserable and mentally bored out of my skull...I can have the cure for that last illness delivered straight to my door. Being too ill to hit a bookstore is no longer an obstacle to my never-ending book obsession. I am particularly grateful for this when I find myself stuck between a very specific rock and a hard place...the rock being a nasty attack of the trigeminal neuralgia and other MS-related ailments. And the hard place? Having nothing new to read to help get my mind off of the war my autoimmune system is waging against me. And so there I was, in that precarious and unfortunate position: with pain at an 8 on the 1-10 pain scale, and I had turned the final page of my latest literary acquisition just last night: Elizabeth Norton's wonderfully enthralling biography, "Elfrida: The First Crowned Queen of England." Who is Elfrida, you might ask? Well, she is the latest leading lady in this "Royal Women I Know Next to Nothing About" phase I've been in these last few months. A) She was the second wife of King Edgar the Peaceful. B) She was the stepmother of King Edward the Martyr and the mother of King Ethelred the Unready. C) She ordered and participated in her teenaged stepson's murder in order to put her own 10-year-old son on the throne...and install herself as Queen Mother, quite possibly the highest position of power a woman could aspire to in the tenth century. Both A and B are correct...but C? That one is no longer the fact I once assumed it was, thanks to Norton's incredibly enthralling and well-researched book. It's one of those books where you feel disappointed when it ends, as it so skillfully envelopes you into this ancient world. It does what all truly good books, films, plays, and television shows do: it leaves you wanting more. Even if I hadn't been left wanting more when I finished "Elfrida" last night, I most definitely would have (and did) this morning, when I woke up after almost four hours of fitful sleep by intense pain in my face, head, back, legs and feet. Oh, cruel MonSter and your devilish timing! What was I to do now?!? 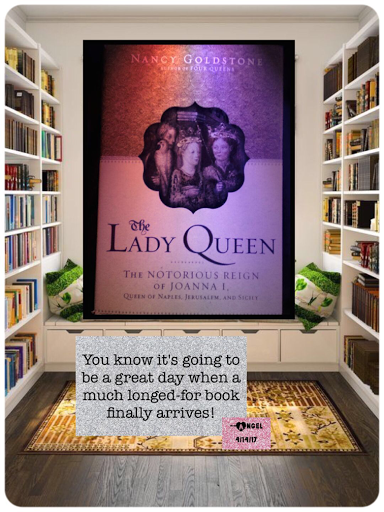 But then, to my joy, the doorbell rang, and a beautiful new book about yet another queen who was possibly maligned by history fell into my eager and very grateful hands: "The Lady Queen: The Notorious Reign of Joanna I, Queen of Naples, Jerusalem and Sicily" by Nancy Goldstone. I know even less about the subject of my latest purchase, Joanna I, than I did about Elfrida. In fact, I know only enough to recognize her as one of the rare women of the Middle Ages/Medieval period who challenged the conventions of their society that demanded women remain in their male-appointed place and leave power and politics, war and law, and even literature and music, in the hands of men. Women like Eleanor of Aquitaine, the Empress Matilda, Queen Boudica, Isabella of Castile, Queen Regent Amalasuntha of the Ostrogoths, Christine de Pizan, Hildegard of Bingen, Isabella of France, Jeanne d'Arc, Matilda of Tuscany, Empress Theodora, Saint Ludmilla, Aethelflaed Lady of the Mercians, Olga of Kiev, Edith of England, Michitsuna No Haha, and Emma Queen of Franks. Women who deserve to be every bit as well-known as their male counterparts, like Alfred the Great, Henry V, Hannibal, Saint Benedict, Charlemagne, and Richard the Lionheart. It is said by memes and t-shirts everywhere that "well-behaved women rarely make history." And like most cliches, there's some truth to it. Some of the historical women I named above were amazing, and some of them were disastrous. Either way, they made history...and were likely to be labeled by the men who overwhelmingly were in charge of writing those histories as a "She-Wolf." It was meant as an insult, but I think we should re-claim the term, and make it a badge of honor. In centuries of male-dominated wolf packs, sometimes a She-Wolf would emerge and reign supreme. I will now, hurt and exhausted, gladly curl up with my new book. The MonSter I fight in real life can't triumph over the She-Wolves battling in the pages within. Into the world of Joanna I of Naples, Jerusalem and Sicily I go. I wonder what I will learn this time?